Map of the Holy Land noting the lands claimed by the Tribes of Israel. A beautiful example of Guillaume and Joseph Delisle's 1763 decorative map of the Holy Land, including Israel and Palestine. 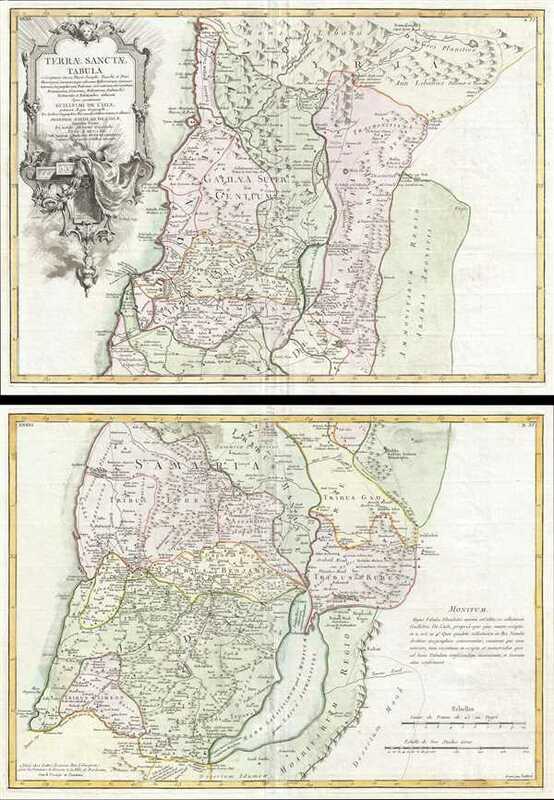 In two sheets, the map depicts the region from Gaza and the Dead Sea north to Sidon (modern Lebanon) and Damascus. This includes the modern-day countries of Israel, Palestine, Jordan, Syria and Lebanon. It names countless biblical locations including the lands claimed by the Tribes of Israel. We can also find the locations of several of the Old Testament's more mysterious cities including Sodom and Gomorra. An elaborate title cartouche in the upper left-hand corner features the Tables of Moses, a sensor, and other religious artifacts. This map was created by Guillaume and Joseph Delisle for issue in Jean Lattre's Atlas Moderne. Very good. Some toning and wear along original centerfold. Minor foxing. Original platemark visible. Image represents two separate sheets. Laor, E., Maps of the Holy Land: Cartobibliography of Printed Maps, 1475 - 1900, 244. Rumsey 2612.081, 2612.082, 2612.083. Phillips (Atlases) 664. National Maritime Museum, 215. British Library (World), col. 384-385 (1762-1785 eds. ).